Today its a big day for me and my little blog because Indian Kitchen has completed one year. I never thought i could make this long. I would like to thank all my family, known & unknown readers and last but not least my dear blogger friends. Mix 1 tbsp maida with tutti frutti & cherries and keep aside. Blend egg and powdered sugar in a mixer. Pour it in a mixing bowl. Add vanilla essence and baking powder to it. Beat it properly and make sure no lumps are formed. Heat oil in a pan or few mins and remove from the heat. Add butter to the egg mixture. Whisk it well. Add maida and oil little by little to this mixture and mix it properly. Add cherries and tutti frutti to it and mix well. Keep it aside. 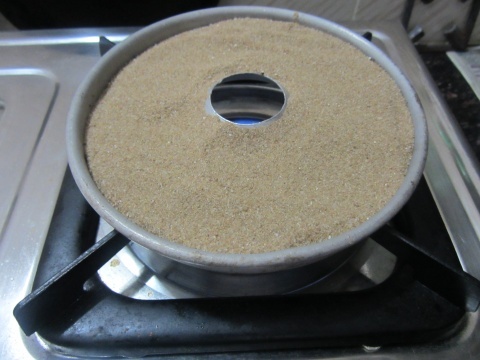 Fill the sand on the small plate which comes along with cake oven. Keep it over stove top on low flame and heat for 5 mins. Grease the inner side of cake oven with oil/butter and spread little maida. Now pour the cake mixture in the cake oven. And close it. Keep it over the small plate which is filled with sand. Let the cake cook on low flame. Wait for 15 mins and check it by inserting a thin stick. Dear Friends, Sorry for the inconvenience created by me. The guest post to swasthi follows shortly. Fruit cake looks very colourful and a nice gas oven. Cake looks wonderful dear…very attractive clicks too. Congrats.Wow! Nice clicks and yummy too.. Perfect recipe…And I really admire your photographs too..you have a very good collection of it in foodgawker…keep rocking..!! Lovely cake!! 1st time here. Love your recipe collection! 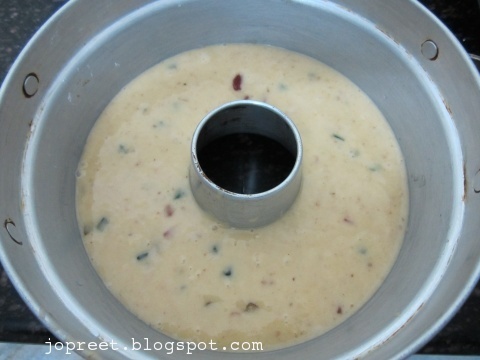 congratulation on first anniversary of your blog preeti… love your oven…. Preeti! congrats. pls check your inbox asap. wow ….that looks so delicious. Congrats dear, and a wonderful way to celebrate it..
Congrats Preeti and happy birthday to ur blog baby, Swasthi is definitely a happiest person to get this fantastic guest post from you, lovely slices and fabulous texture. Congrats Dear, lovely presentation n yummy cake, wonderful guest post I say!!! Congratulations and the cake looks delicious. that cake oven looks beautiful .. didn't know something like that exists…. will u please let me know where to find that cute looking cake oven.. its samma interesting! hi swati, my mother bought this cake oven in surat long time back..
Congrats Preethi and the cake is perfect..
Congrats onyour blof anniversary. Just realized I wasn't connected with you through google.. Congrats!! 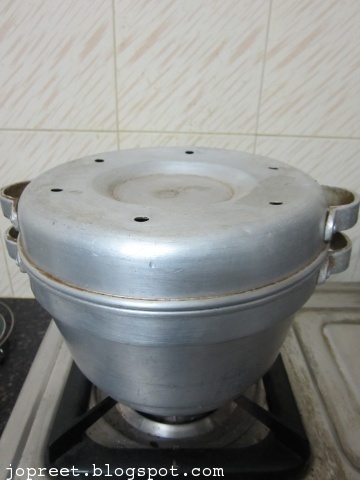 looks grt.. n sooperr looking cooker..
Mehrin, my mom bought this pan in Gujarat. I’m not sure if its available in Dubai..